“Good Morning!” | "On Dragonfly Wings with Buttercup Tea"
1. Preheat oven to 450°. Stir together first 4 ingredients in a large bowl. Cut butter into flour mixture with a pastry blender until crumbly and mixture resembles small peas. Freeze 5 minutes. Add 3/4 cup plus 2 Tbsp. cream, stirring just until dry ingredients are moistened. Chocolate-Cherry Scones: Stir in 1/4 cup dried cherries, coarsely chopped, and 2 oz.coarsely chopped semisweet chocolate with the cream. Apricot-Ginger Scones: Stir in 1/2 cup finely chopped dried apricots and 2 Tbsp. finely chopped crystallized ginger with the cream. Drizzle with Vanilla Glaze after baking. Cranberry-Pistachio Scones: Stir in 1/4 cup sweetened dried cranberries and 1/4 cup coarsely chopped roasted salted pistachios with the cream. Brown Sugar-Pecan Scones: Substitute brown sugar for granulated sugar. Stir in 1/2 cup chopped toasted pecans with the cream. Ham-and-Swiss Scones: Omit sugar. Stir in 3/4 cup (3 oz.) shredded Swiss cheese and 3/4 cup finely chopped baked ham with the cream. Serve warm with Mustard Butter: Stir together 1/2 cup softened butter, 1 Tbsp. spicy brown mustard, and 1 Tbsp. minced sweet onion. Pimiento Cheese Scones: Omit sugar. Stir in 3/4 cup (3-oz.) shredded sharp Cheddar cheese and 3 Tbsp. finely chopped pimiento with the cream. Rosemary, Pear, and Asiago Scones: Omit sugar. Stir in 3/4 cup finely chopped fresh pear, 1/2 cup grated Asiago cheese, and 1 tsp. chopped fresh rosemary with the cream. 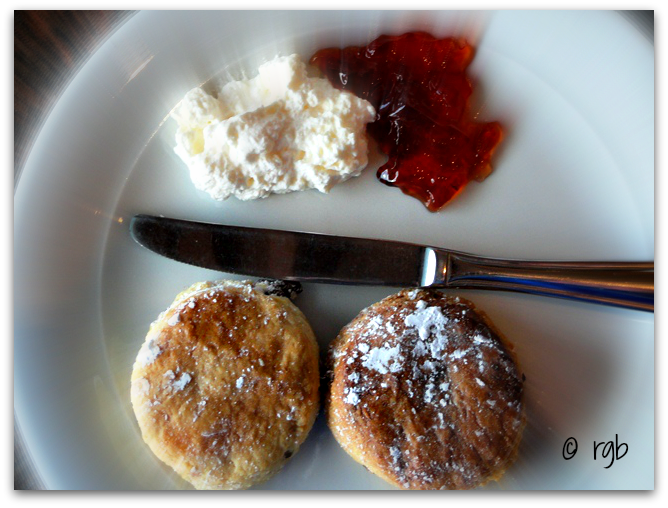 This entry was posted in Kitchen Love, Photos and tagged challenge entries, good morning, photos, postaday, recipe, scones, Weekly Photo Challenge. Bookmark the permalink. These sound delicious, Becca. Thanks for the recipe. Just got back from England where we enjoyed plenty of scones and tea. Your post is timely. 😉 Thanks!!! Oh yum! Thanks for the recipe. Nice!! Love to get a great recipe with a great photo! That is so right up my street – yum. …can we ever have enough SCONE recipes?…especially when I have…zero!